The Giant Kelp, Macrocystis pyrifera, concentrates iodine in its tissues 2,000 times over that found in ambient seawater (based on fresh weight; Rosell & Strivastava 1984) providing a method for detecting the presence of low concentrations of I-131 in seawater. Iodine-131 detected in samples of kelp from southern California does not have its origins in Fukushima. Because of decay (half-life of only 8 days), I-131 that entered the ocean from the Fukushima Daiichi Nuclear Power Plant has decayed away and is not a component of the seawater plume moving eastward in the ocean currents. Also, as our radio-cesium data shows, this seawater has yet to contact the west coast of North America. Eight days after its release into the atmosphere on March 12, 2011 from the damaged Japanese nuclear plant, I-131 was detected in southern California kelp (Manley & Lowe 2012). This I-131 has long since decayed away. If the I-131 detected in southern California kelp were the result of a release of nuclear waste, there would be a variety of other fission-produced isotopes that would be present as well. The fact that none of these other products are present indicates that the I-131 is a pure source. All kelp samples collected during the first sampling period from Los Angeles and Orange Counties had detectable amounts of I-131 present. The highest concentration of I-131 in these samples was from the outer breakwall of the Los Angeles / Long Beach Harbor Complex (LB-1, 152 Bq kg-1). 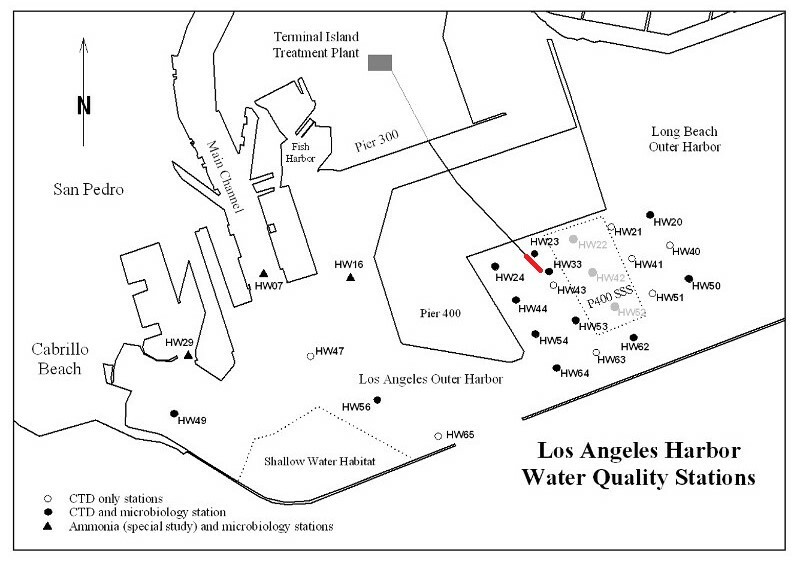 To our knowledge, the nearest wastewater outfall is off Whites Point on the Palos Verde Peninsula. Two outfalls that are in continuous use extend 2 miles into the ocean at a depth of approximately 200 feet (Sanitation Dist. LA County 2012). The placement of these outfalls is to prevent up-welling of effluent into surface waters. Two other outfalls are shorter (~1 mi) and shallower (~150 ft) than the others, and are used only during peak storm flows; they most likely were not in use during the weeks prior to the collection dates. I-131 concentrations from kelp (first sampling period) closer to the White Point outfalls show much lower levels (CSC-1, 25 Bq kg-1 and Law-1, 23 Bq kg-1) than the outer breakwall sample, suggesting that this may not be the source. Thus a source within or close to LA/LB Port complex was suspected based on the data from round 1. Kelp samples taken in late 2013, as test runs for Kelp Watch 2014, and during round 2 from the Ports of Los Angeles and Long Beach (LB-2a – e) show relatively high I-131 activity, strongly suggesting that this is a local source . 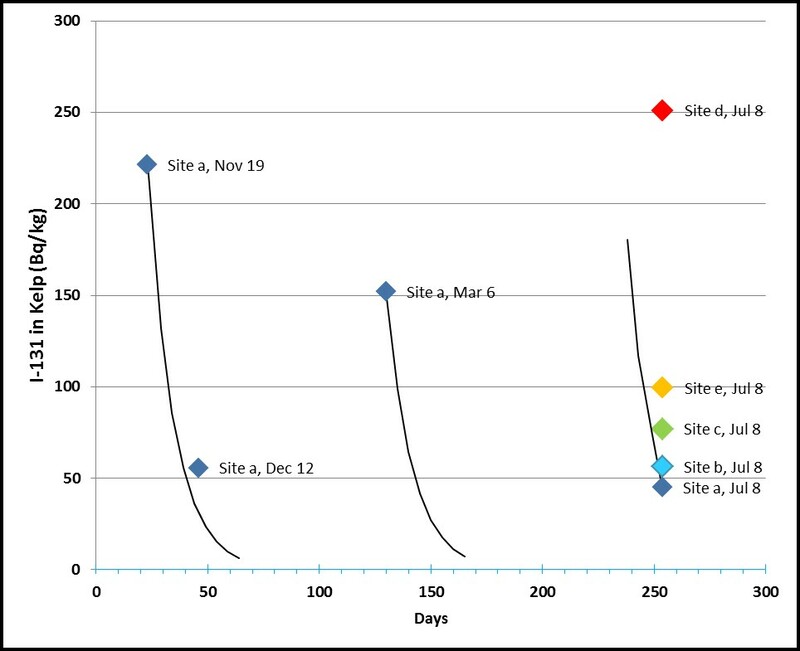 Samples taken from the same location just outside the port breakwall on 4 separate occasions (LB-0 through 2) indicate at least three separate inputs over the period from November 2013 to July 2014 (See Figure 1). Four samples taken from several sites on July 8 2014, strongly suggests that the source is within the port itself (Figures 1, 2). Figure 1. I-131 levels in kelp samples from Los Angeles / Long Beach Port Lines represents calculated decay from Site a with samples collected 11/19/13, and 3/6/14. Decay shows that I-131 was from separate inputs. Sample collected 12/12/13 has I-131 level that is consistent with decay from 11/19/13. The I-131 in the Site a sample collected on 7/8/14 was also from a separate input event, as back calculated decay shows. Figure 2. 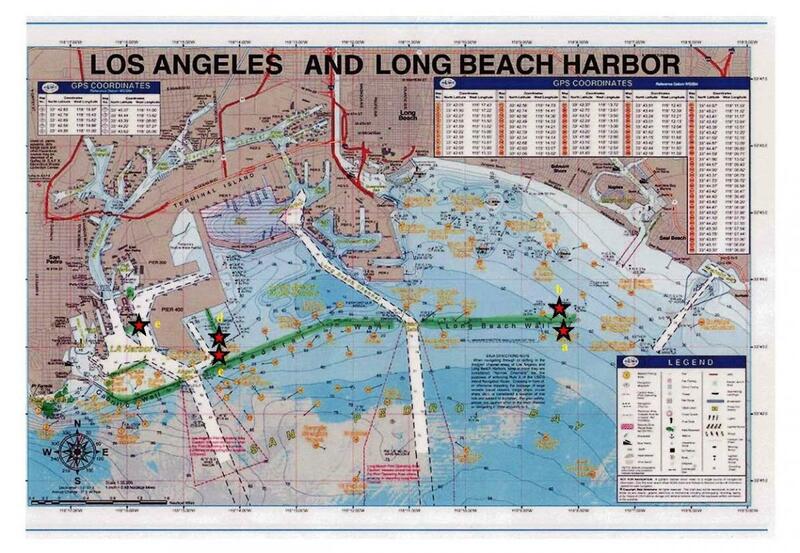 Map of Los Angeles / Long Beach Port Complex. Stars indicate Sites A through E, sampled 7/8/2014. Green marks areas with Macrocystis. Although the amount of I-131 present in kelp tissue is small when compared to the amount of naturally occurring K-40 (~4,000 Bq kg-1), the amount of I-131 potentially released into the LA/LB port seawater is significant. Using the mean kelp I-131 value for all port samples (n=8) of 120 Bq kg-1 dwt (or 12 Bq kg-1 fresh wt.) , and assuming the value is the equilibrium value, then the effective seawater I-131 concentration in contact with the kelp would be 6.0 mBq L-1. Assuming the top 3 m of seawater containing that concentration of I-131 was uniformly mixed throughout the port, with the port complex containing 31 x 106 m2 of water surface area (Prickett, personal com), the total amount of I-131 present in the surface water (93 x106 m3) would be 560 MBq (5.6 x 108 Bq or 15.7 mCi). The total volume of the port is 415 x106 m3 (at Mean Sea Level; Prickett, personal com), so the total amount of I-131 if equally dispersed throughout the port would be 2.5 GBq or 68 mCi. On July 8 site d (LB-2d) had the highest activity, nearly 5.6 times that of site a (LB-1), an estimated total amount could be as high as 380 mCi throughout the port. There appears to be a continual state of I-131 contamination of the seawater within the Los Angeles/ Long Beach Port; this warrants continued monitoring and determination of the source. The EPA drinking water Maximum Contaminant Level (MCL) for I-131 is 3 pCi/L which is ~19 times greater than the estimate of I-131 in port seawater 1 (0.16 pCi/L or 6.0 mBq/L). There is no MCL for coastal waters, bays, or estuaries. The effect of very persistent, low levels of I-131 on marine organisms is not known. However, the presence of I-131 in the marine environment is of concern because of its proclivity to be absorbed, assimilated, concentrated, and metabolized by marine organisms. It is known that marine invertebrates and seaweeds incorporate iodine into a variety of organic compounds. (Gribble 2003). The amount of I-131 present in kelp tissue could affect certain marine vertebrates, because it can bind to and be localized in thyroid tissue. Organisms with potential risk would be fish that ingest kelp or other seaweeds. Even primitive marine chordates such as tunicates (sea squirts) and cephalochordates (lancelets), have a thyroid-like structure that also binds iodine and secretes iodine-containing compounds (Romer and Parsons 1977; Hiruta et al., 2005). Because Macrocystis is the bases of the kelp forest ecosystem which is very productive and complex, the distribution of I-131 throughout this biological community within the port is to be expected. It is important to document and monitor this contamination. There are two known commercial practices which use large amounts of pure I-131: use as a radiopharmaceutical, and use as a radioactive tracer in the hydraulic fracturing process associated with oil and gas extraction. I-131 is one of several radioisotopes with a short half-life that are used as a radioactive tracer in the hydraulic fracturing process associated with oil and gas extraction to determine the injection profile, and to determine flow rates (Reis 1996, IAEA 2003). Radioisotopes and other compounds used in fracking have found their way into surface waters from accidental spills or unintentional releases (Bartrand, and Rosen 2013; Brown 2007). We do not know if fracking is presently occurring within or close to the port, or whether I-131 is being used. on Drinking Water Sources Water Research Foundation. Brown, V. J. 2007. Industry issues: Putting the heat on gas". Environ. Health Perspectives 115: A76. doi:10.1289/ehp.115-a76. Carolan J.V., Hughes C.E. & Hoffmann E.L. 2011. Dose assessment for marine biota and humans from discharge of 131-I to the marine environment and uptake by algae in Sydney, Australia. J Environ. Radioact. 102:953–63. Gribble, G.W. 2003. The diversity of naturally produced organohalogens. Chemosphere 52: 289-297. Hiruta J., Mazet F., Yasui K., Zhang P. and Ogasawara M. 2005. Comparative expression analysis of transcription factor genes in the endostyle of invertebrate chordates. Developmental Dynamics 233:1031–1037. Manley, S.L. & Lowe, C.G. 2012. Canopy Forming Kelps as California's Coastal Dosimeter: 131-I from Damaged Japanese Reactor Measured in Macrocystis pyrifera. Environ. Sci. Technol. 46: 3731–36. OSPAR Commission, 2002. Discharges of Radioactive Substances into the Maritime Area by Non-Nuclear Industry Radioactive Substances Series, Publication # 161. Romer, A.S. and Parsons, T.S. 1977. The Vertebrate Body. Philadelphia: Holt-Saunders International. pp. 555–556. Rose P., Swanson R.L. & Cochran J.K. 2012. Medically-derived 131-I in municipal sewage effluent. Water Res. 46:5663–71. Rosell, K.-G. & L. M. Srivastava, 1984. The seasonal variations in the chemical constituents of the marine brown algae Macrocystis integrifolia and Nereocystis luetkeana. Can. J. Botany; 62: 2229-2236. Sanitation Districts of Los Angeles County & U.S. Army Corps of Engineers, Los Angeles District. 2012.Clearwater Program; Environmental Impact Report/Environmental Impact Statement, Final 2012. Chpt 2.